Yet another health drink from Greenmax, the Yam Nutritious Cereal. My colleague gave a few packets to me because she did not realise it is savoury when she bought it. She prefers the sweet ones. 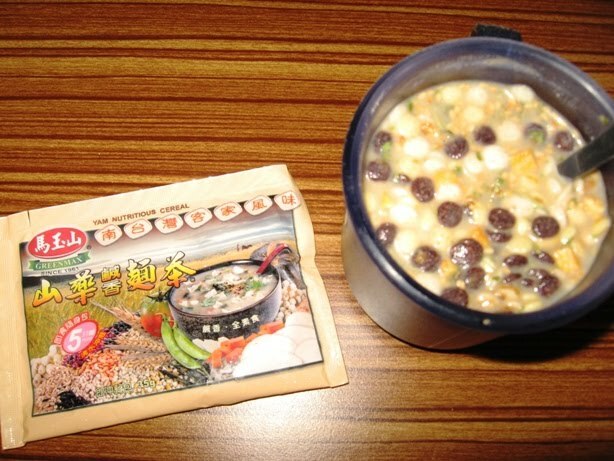 It taste more like soup than a drink to me. Best to serve hot. 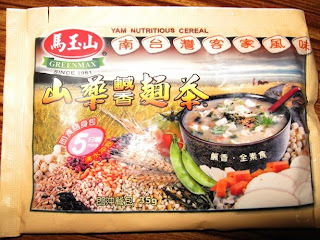 The ingredients as indicated in the packet : Yam, Tomato, Pumpkin, Seeds, Green Tea, Job's Tear, Wild Rice, Flat Red bean, Black Bean, wheat Germ, Black Sesame, White Sesame, Sea Weed, Oats, Buck'wheat, Wheat (Cereal Containing Gluten), Vegetables (Carrot, Cabbage, Celery), Sea Salt.